This article is about the train operating company. For other uses, see Island Line (disambiguation). Island Line Trains is a train operating company which runs the 8 1⁄2-mile Island Line on the Isle of Wight. Island Line is part of South West Trains, a rail franchise in the United Kingdom owned by Stagecoach. The name Island Line first came into use in 1989, when Class 483 trains were introduced on the route. This new brand name and a logo were included on the trains' livery. However, this re-branding did not officially occur until 1994, when it had completely replaced all RydeRail branding. From 1989 until 1996, Island Line existed as a sub-brand of Network SouthEast. In 1996, passenger services on the line were privatised as the Island Line franchise, with the winning bid from Stagecoach (legal name Island Line Limited). On commencing operations on 13 October 1996 the name Island Line for the passenger service was retained. Island Line was the only passenger franchise that included maintenance of the infrastructure in addition to the running of passenger services. 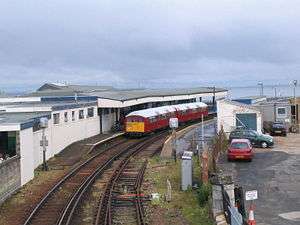 Island Line was reportedly Britain’s most reliable and punctual train company. The shortness and simplicity of the route may be the reason for this. The Island Line franchise was, until February 2007, the smallest train operating company on the National Rail network. It was combined with the South West franchise to make the new South Western franchise in an effort to reduce the number of Train Operating Companies. Although South West Trains now operates the line, the Island Line branding has been retained. Island Line Trains have repainted all their stations in a heritage cream and green colour scheme, as part of a general station improvement package. Standard National Rail vehicle types cannot be used by Island Line Trains, due to the low ceiling of Ryde Tunnel. Instead, services are operated using Class 483 units, which are refurbished ex London Underground tube trains originally built in 1938. These replaced the older Class 485 and Class 486 units, which dated from 1923 and were introduced to the island in 1967 when the line was electrified. When the Class 483 trains were introduced, they were painted in the standard Network SouthEast livery. In 2000, several years after the start of the original franchise, the stock was painted into a blue livery with large pictures of dinosaurs, aiming to entice tourists in the summer months when passenger numbers are high. Two units were later painted into London Transport colours, which the units would have had when operating on the London Underground. There are yellow warning panels on the front ends of the units, a modern feature for the benefit of track workers and a change compared with the original red. The entire fleet was repainted into this livery by the end of 2008. Following its successful bid for the new integrated franchise, South West Trains announced that there were no plans to replace the current rolling stock, instead they would invest "to ensure the continued viability of the existing Island Line rolling stock and infrastructure". Trains that are similar to mass transit that is smaller may be bought soon from any metro system, such as London Underground. As a cost-cutting exercise, South West Trains bought the rolling stock from the leasing company HSBC Rail in March 2007. This means the leasing costs, which were reimbursed by the government, have been eliminated, thereby lowering the line's tax burden. ↑ Hardy, Brian (2003). Tube Trains on the Isle of Wight. Harrow Weald, Middlesex: Capital Transport. p. 75. ISBN 1-85414-276-3. ↑ "Stagecoach wins railway franchise". BBC News Online. 22 September 2006. Retrieved 26 August 2007. ↑ "Island Line Online - Contact Us". Archived from the original on 23 July 2007. Retrieved 26 August 2007. Island Line is a brand name of Stagecoach South Western Trains Ltd.
↑ "Spruce up for Island Line stations". South West Trains. Retrieved 3 September 2007. ↑ "1938 tube stock on the Isle of Wight". Retrieved 13 March 2009. ↑ "Stagecoach Group welcomes South Western Rail Franchise win". South West Trains. Retrieved 2016-04-04. ↑ "Island Line buys trains for £1". Solent TV. 28 March 2007. Archived from the original on 27 September 2007.